A series of paintings that transform personal experiences of grief into monumental panoramas of swirling line and intense colour. The approximately 500 photographs Meigs took in New Freedom became source material for a series of modestly scaled paintings, The Basement Piles, and a catalyst for the more monumental The Basement Panoramas, which are each based on real basements whose locations are named in their titles. Basements, often filled with unsorted things we store for future use and collections of the residue of lives, ornamented by tangled systems of wiring, heating and plumbing, hidden from everyday existence above ground, can be read in these works as an architectural scenario analogous with the structures and processes of the unconscious mind. 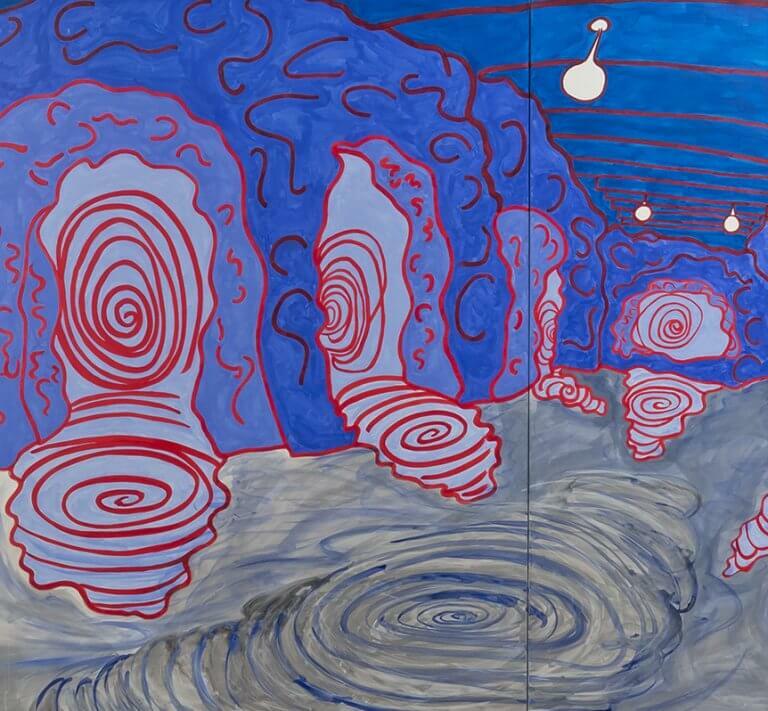 In Meigs’ paintings, the physical shape of the basement breaks down into vigorous spirals and swirling lines, spreading and layering and changing direction as if of their own accord. Frequently interspersed with charged text, The Basement Panoramas reflect on mortality and rebirth, the hidden drives that both animate us and hold us in their confining embrace. Alternating between exuberant, expansive colour and gesture, and nightmarish claustrophia and repetition, these works are a document of the will, as intensity, as persistence, and as escaping endlessly beyond our control.